Dance Off the Inches is a series of dance-inspired workouts. I’ve enjoyed most of them, and I think I found my absolute favorite of the series so far. Dance Off the Inches: Cardio Hip Hop Party with Jennifer Galardi is a blast. The workout is about 40 minutes long. It includes a warm-up, dance workout, and cooldown. The dance workout is divided into three segments: Old School, Hip Hop House, and Video Jam. The Old School segment just might be the best of the DVD, but I am biased because it includes long-lost favorites like the Roger Rabbit and Cabbage Patch. Oh yeah. The next section, Hip Hop House, is the highest intensity. Video Jam slows down quite a bit, and Galardi encourages viewers to add their own style to the moves. Galardi is a fun instructor. Her cueing is great, and she is lively. The choreography is challenging at first, but it’s doable. 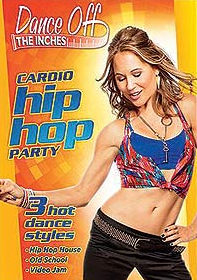 There’s a twenty-minute step tutorial included on the DVD if you want to learn the moves before you start the workout. I find the tutorial a bit dull. It’s just the instructor demonstrating the moves with no music. I’m happy that this is done in a separate section, so it doesn’t slow down the workout. Also, I found some of the moves were not good to try on carpet. Overall, this was an enjoyable workout that is a keeper for my collection.